Princess Sweet – A delightfully sweet red wine to enjoy on its own or as an after dinner treat. Frontenac – A light fruity wine with a distinct bright cherry aroma. Chambourcin – Medium bodied with red fruit and earthy complexity. Aged in Missouri Oak Barrels. Red Blend – A dry, perfectly balanced easy drinking patio wine. 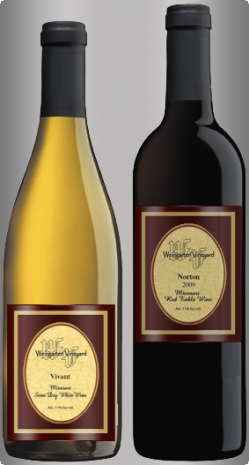 Norton Oaked 2010 – Aged in Missouri produced American Oak barrels for 18 months to add complexity & softness. Norton 2011 – Full bodied with blackberry jam and spice on the nose. Finishes with soft tannin. Aged in Missouri Oak Barrels. Norton 2012 – An excellent vintage that displays rich aromas of dark berries, mocha, smoke, and cooking spice, full and lingering on the palate and finishes with soft tannin. Aged in Missouri Oak Barrels. We also feature a variety of hand selected wines from other regions. When you come to relax at our Missouri winery, we want you to have access to a wine cellar that suits every taste and preference. At Weingarten Vineyard, we have something for everyone. Check out our variety of Beers here. Come and let your taste buds enjoy the many flavors our winery has to offer. We are sure to have something for everyone.